How do you access your backpack without taking it off? Mindshift has the answer. The Backlight Elite 45L is the biggest backpack yet in the Mindshift Backlight Elite range from Think Tank, and it’s a backpack with a difference. Normally with backpacks, if you want to get access to your gear you have to shrug them off and put them on the ground. Some have openings on the front, but that can mean getting mud or moisture on the back, which then transfers to your clothing. Others have openings on the back so that it’s the front that gets dirty. Neither is quick, neither is ideal. The Mindshift Backlight range works differently because you don’t have to remove your backpack at all. You shrug off the shoulder straps and swing it round on its broad, padded waist belt – there’s even a neck strap to keep the lid clear as you rummage through your lenses and camera bodies. The Elite 45L also has a front pocket with a 5-litre capacity, two large water bottle pockets and attachment points for a walking pole, tripod and even cycle lights. 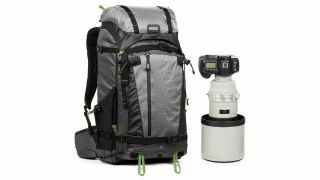 Other optional accessories include a tripod suspension kit, lens switch case and Filter Hive. There’s also a separate pocket for a 13-inch laptop and tablet, making it ideal for photographers who need to store, edit and share images on location. We're backpack nerds on Digital Camera World, so we've actually made a list of the best camera backpacks you can get right now. The Mindshift Backlight Elite 45L is available now priced at £399.